Clayton Hurdle farms cane, corn, wheat and soybeans in rich soils and the occasional 100 mph blow. Clayton Hurdle farms on a 5-mile-wide isthmus of Delta soil poking down into America's largest swamp. Hardwood bottoms, bayous, bald cypress swamps and grass marshes, and innumerable fingers of brackish water. Bracketed by the Mississippi River on the east and the Atchafalaya River on the west, the Atchafalaya swamp is the southern terminus of a system draining four-tenths of the continental U.S. It's water and soils moving toward the Gulf of Mexico–water key to American agriculture–not even two hours of driving time from Hurdle's farm. It was a hot day–no clouds for shade. And while we were not standing in the swamp, the humidity was certainly borne there. These are rich Louisiana soils, Hurdle says, walking up to a cane field just outside Rosedale, not too far from a good lunch at Big Head's Bar-B-Q just off I-10 and a few miles down the road from Baton Rouge. The farm is the result of levees that protect the sugarcane, corn, soybeans, wheat, milo and hay grown on Hurdle's 2,800 acres and on nearly 200 other farms in Iberville Parish. "We can grow anything here," Hurdle says. "But the rains," he cautions, "can tear us up." He means heavy, drowning rains. Rains produced by hurricanes. One in particular, a gale by the name of Gustav, roared up from the Gulf and into the parish Sept. 1, 2008. Hurdle took shelter in his house–"I will never do that again," he says–as Gustav ripped at his home and fields with 100-mph winds and 22 inches of rain. It was an expensive bout of weather. Cane can withstand water. Hurdle lost maybe 10% of the crop. But the area lost three-quarters of its soybeans and all of its corn and cotton. It was the fourth most destructive storm to hit the U.S., killing more than 40 people in Louisiana and causing $4.3 billion worth of destruction before a much-diminished Gustav merged with another system moving across the U.S. This is a farming family that survives hard times. Hurdle's grandfather moved into Louisiana with a brother, coming down from Tennessee. Grandfather farmed through the Depression with 10 children to feed. Young Clayton Hurdle learned the business from his father and three of his father's brothers, who grew sugarcane, soybeans and raised cattle for more than 40 years. Clayton went off to earn a degree from Louisiana State University. Upon his return, Hurdle and his father farmed together for five years. But Clayton wanted more responsibility and a more diversified farm. "I wanted to farm, but not as a farmhand," Hurdle says. "I was ready to take some bigger chances." With a rent-to-own agreement in hand from his father, Hurdle began to move the farm away from an operation that had evolved into growing only soybeans. "This was a high-risk operation with all our assets concentrated on one crop," Hurdle says. "I experienced the wrath of nondiversification. Mother Nature was the teacher, sending an entire week of rain to coincide with a harvest that produced 1,000 acres of damaged beans." Lesson learned, he began to bring back corn, milo and wheat to the farm, in addition to the soybeans. His soybeans average more than 50 bushels; and he has seen some 60-plus bushel beans. Corn yields routinely top 180 bushels and have reached 220 bushels. Hurdle has 60,000 bushels of storage and plans to improve his storage capability. He generally does not grow any more corn than he can store. "You can make a lot of money growing corn. But you can lose a lot too," he says. Aflatoxin is a common problem. Four years ago, likely to the surprise of his father who had gladly exited the sugar business, Hurdle found an opportunity to move the farm back into sugar. Sugarcane is not an easy enterprise. No producer grows cane without an allotment. It takes three years to see any real money out of it. Once the harvest begins, it's a 100-day sprint–trucks from the processor arriving to collect the cane night and day. But it's a money-maker. "It's been the most profitable so far," he says. "Cane gives you some stability that grain does not." Sugarcane works well in rotation with corn and soybeans, a rotating crop that breaks up weed, insect and disease pressures. His average grain yields have moved sharply upward with sugarcane in the lineup. "I have the most advantageous financial leverage with my crop diversification," he says. In one more piece to his diversification pie, Hurdle also raises registered Brahman cattle generally sold to foreign buyers. Hurdle has expanded the size of the farm since he began farming. Of the 2,800 acres he works, he owns 135 acres–and would very much like to own more. But those opportunities are rare. "There just isn't a lot of land to be bought. Most land that is sold is usually bought by someone outside of agriculture." With that level of demand for land, rents are high too. "For now, I want to be efficient on what I do have," Hurdle says. "That's the one thing I can do is increase our productivity, bring in new crops and invest in new technology." He has been bringing precision-farming technology to the operation. This past season he applied lime with variable rate technology. "The pH has to be right," he says. "We'll see good effect right away." Technology is going to feed a growing population, he believes. "We've seen a technology revolution in the past 10 or 15 years," he says. "I wonder where it's all going to go in the next 10 or 15 years." Hurdle is working in a new direction to increase dollars earned per acre. In partnership with 700 other producers, he is joining into a sugar-refining venture with Cargill and Colonial Sugar. 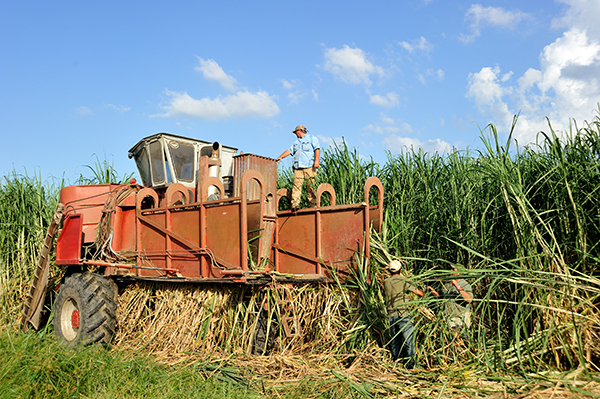 When the business opens, in time for the 2011 cane harvest it is hoped, sugar growers in this new business will earn the 5-cent-per-pound margin a processor normally takes processing brown sugar, derived from the cane, to the white sugar sold to consumers. "We're buying up into the processing chain," Hurdle explains. Hurdle has plugged his farm into the community. 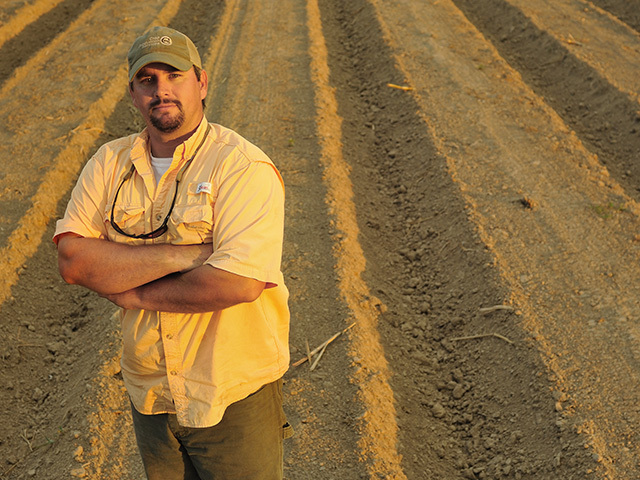 He is deeply involved in the Young Farmers and Ranchers Program of the Louisiana Farm Bureau. He works as a Young Farmers recruiter, who encourages farmers his age to become active in their communities. Hurdle is a county Farm Bureau board member and voting delegate. He is an LSU Agriculture Leadership Program graduate, a volunteer teacher in the local schools and a food bank volunteer. Hurdle works within the farming community because he's optimistic about its chances. He and his wife, Kerri, are raising their two children, a fifth generation of Hurdles, who may one day farm. Clayton sees no reason why they wouldn't. "This business is hard," he says. "But it's not impossible. The world is growing, and they are not making any more land."